A standard shift lasts 3-4 hours and trucks are rotated out every shift. Different cuisines are cycled in for future shifts to ensure we don’t have repetitive options. For instance, we wouldn’t schedule a burger truck 2 days in a row even if they were different trucks. Tastings: We offer several cuisines and give them out in ¼ or ½ size entrees so attendees can try different trucks, some say variety is the spice of life. We supply vouchers for programs like this and attendees are given a certain amount of vouchers and can redeem them as they go. This helps to control budgets and ensure that we will prepare enough food. Entertainment: Our Mobile DJ Truck changes the dynamic of the above mentioned events, adding music and giving leaders the ability to address those in attendance with our wireless microphones taking things to the next level. We can follow a specific playlist if you’d like or create our own mixes that match the theme of your event. We even have musicians on call if you’d prefer a live performance for your event. Some of our musicians are so versatile they’ll bring 4-5 instruments to play themselves while entertaining as a solo act! 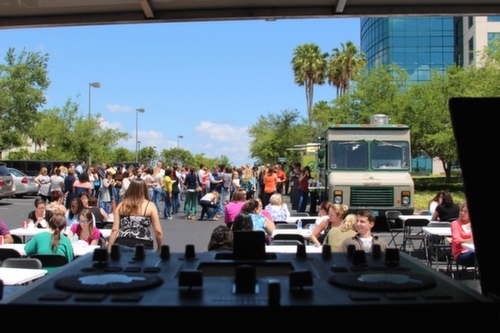 Tables and Seating: Our Mobile DJ Truck doubles as a transport unit for seating for Tastings and Caterings. By adding seating and music, things really start to come together as a celebration. Dance Floor: We also have a portable dance floor we can setup that is 15’x15’ and is real wood! So if your employees really know how to party we can give them a place to let out their inner break dancing skills. Tents to Snow Makers: Are you strapped for time and have a ton of things to coordinate? Just tell us what you need and we’ll take care of it, we have great relationships with rental centers around the state of Florida. Please contact us at any time, we hope to rally with you soon!